Anders Skrondal is a Senior Scientist at the Division of Epidemiology, Norwegian Institute of Public Health and an Adjunct Professor of Psychometrics at the Centre for Educational Measurement, University of Oslo. His research interests include topics in statistics, biostatistics, social statistics, econometrics and psychometrics. Skrondal started his career as a Research Fellow in the Department of Economics and as a Researcher in the Department of Biostatistics, both at the University of Oslo. His Doctor Philos thesis in Statistics was awarded the 1997 Psychometric Society Dissertation Prize, judged on "the level of originality in the ideas and techniques, the possible applications and their treatment, and potential impact". He was subsequently awarded a personal Postdoctoral Fellowship from The Research Council of Norway which was spent at the University of London and the University of Manchester. After returning to Norway in 2001, Skrondal became a Senior Researcher and subsequently Head of the Biostatistics Group at the Norwegian Institute of Public Health. In 2005 he took up a position as Professor of Statistics in the Department of Statistics at the London School of Economics (LSE) and was subsequently appointed as Director of the LSE Methodology Institute. After spending almost four years at the LSE, Skrondal returned to the Norwegian Institute of Public Health where he is currently a Senior Scientist. He recently served as Adjunct Professor of Biostatistics in the Department of Mathematics, University of Oslo. A major part of Skrondal's statistical work has been related to the development of the Generalized Linear Latent and Mixed Model (GLLAMM) framework which unifies and generalizes latent variable modeling and multilevel modeling. Output include papers published in statistical, biostatistical, psychometric and econometric journals as well as several bestselling books. Skrondal also collaborates with researchers in medicine, psychology, and the social sciences, and was recently instrumental in publishing a paper in the New England Journal of Medicine. In total, he has published papers in more than 50 different peer-reviewed journals and 12 books. His h-index is 46 in Google Scholar, meaning that his 46 most-cited publications have each been cited at least 46 times. The gllamm software for fitting GLLAMMs has been used in articles in more than 700 different journals. Skrondal is regularly giving workshops and keynote lectures on his research worldwide. Anders Skrondal was recently elected as President of the Psychometric Society for 2016-2017. 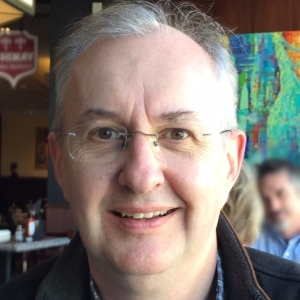 He is an Honorary Professor at the London School of Hygiene and Tropical Medicine (LSHTM) and an elected member of the International Statistical Institute and the Board of Trustees of the Psychometric Society. Skrondal is a former co-editor of the journal Statistical Methods in Medical Research and of the Chapman & Hall/CRC book series Statistics in the Social and Behavioral Sciences, and has been an elected member of the Research Section Committee of the Royal Statistical Society (selecting papers to be read for the Society) and the editorial council of Psychometrika. Skrondal has served on scientific committees for international conferences, taken part in expert panels evaluating academic institutions, served as member of international scientific advisory boards, and reviewed research proposals and/or research programs for various funding bodies worldwide. Breinegaard, N., Rabe-Hesketh. S. and Skrondal, A. (2015). The transition model test for serial dependence in mixed-effects models for binary data. Statistical Methods in Medical Research, in press. Rabe-Hesketh. S. and Skrondal, A. (2015). Generalized linear latent and mixed models. In W.J. van der Linden (ed.) Handbook of Item Response Theory: Models, Statistical Tools, and Applications (Vol. I). Boca Raton: CRC Press, in press. Rabe-Hesketh. S. and Skrondal, A. (2015). gllamm. In W.J. van der Linden (ed.) Handbook of Item Response Theory: Models, Statistical Tools, and Applications (Vol. III). Boca Raton: CRC Press, in press. Skrondal, A. (2014). Much ado about interactions (Invited Commentary). Epidemiology, 25, 723-726. get . Skrondal, A. and Rabe-Hesketh. S. (2014). Protective estimation of mixed-effects logistic regression when data are not missing at random. Biometrika, 101, 175-188. get . Skrondal, A. and Rabe-Hesketh. S. (2014). Handling initial conditions and endogenous covariates in dynamic/transition models for binary data with unobserved heterogeneity. Journal of the Royal Statistical Society, Series C, 63, 211-237. get . Rabe-Hesketh. S. and Skrondal, A. (2013). Avoiding biased versions of Wooldridge's simple solution to the initial conditions problem. Economics Letters, 120, 346-349. get . Haberg, S.E., Trogstad, L., Gunnes, N., Wilcox, A., Gjessing, H.K., Samuelsen, S.O., Skrondal, A., Cappelen, I., Engeland, A., Aavitsland, P., Madsen, S., Buajordet, I, Furu, K., Nafstad, P., Vollset, S.E., Feiring, B., Nokleby, H., Magnus, P. and Stoltenberg, C. (2013). Risk of fetal death after pandemic influenza virus infection or vaccination. New England Journal of Medicine, 368, 333-340. get . Skrondal, A. and Kuha, J. (2012). Improved regression calibration. Psychometrika, 77, 649-669. get . Rabe-Hesketh, S. and Skrondal, A. (2012). 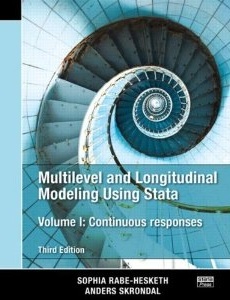 Multilevel and Longitudinal Modeling Using Stata (Third Edition). College Station, TX: Stata Press. Volume I: Continuous Responses.